While examining the available literature on health and nutrition from an evolutionary standpoint, one comes to the inevitable conclusion that, as far as diet is concerned, human beings entered a blind alley thousands of years ago. Even if by some miracle humanity as whole was to completely reorganize its diet overnight, an important question remains – have we engineered our environment beyond the point of no return? Contrary to the popular belief held by many anthropologists that agriculture is one of man’s greatest achievements, there is an increasing body of evidence which suggests that the human race actually set out on the path of self-destruction when it embraced agrarian societies. The picture now emerging is that the switch from hunting and gathering occurred suddenly and was followed by a sharp drop in life expectancy. Ancient human bones found in archaeological layers dated since the adoption of agriculture reveal increased prevalence of disease and lesser numbers of aged people. For centuries after the adoption of agriculture, these bones also tell the stories of greater numbers of violent deaths when compared with bone remains from pre-agrarian hunter-gatherer societies. 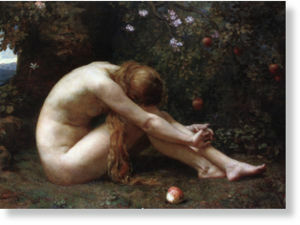 There is an undeniable echo of the Garden of Eden story here. This is, in fact, one of the greatest puzzles of prehistory. Why did agriculture catch on so fast? It seems that agriculture was suddenly and independently adopted at several sites all around the globe, including the Middle East, Sub-Saharan Africa, China and Mexico. From these sites it spread with considerable speed all over the planet. Today only a few isolated and insignificant populations of hunter-gatherers remain, mostly in the Southern hemisphere. The speed at which agriculture spread from centres of original adoption may seem slow to the modern traveller, but it is remarkable by the standards of earlier innovations in prehistory. So far no satisfactory explanation has been offered for this puzzle. Most anthropologists have settled for the theory that overwhelming productivity of new technology was simply irresistible to our ancestors. But this theory doesn’t seem viable bearing in mind puzzling evidence from the skeletons of the first farmers. Bone and tooth studies of some of the earliest agricultural communities in the Middle East show that farmers had worse health (due to poorer nutrition) than the hunter-gatherers who preceded them. Another theory tries to explain the adoption of agriculture by way of population pressure. According to its proponents, ancient humans were unable to stem the population explosion so they willingly sacrificed a surprising degree of security and freedom intrinsic to their previous way of life to adopt a life of toil, disease and stress. However, this doesn’t make much sense either. Evidence suggests that the hunter-gatherer populations were stable for very long periods of time and points to the conclusion that pre-agricultural communities lived in relatively harmonious balance with their environment. It will certainly take some time before this great mystery can be solved. 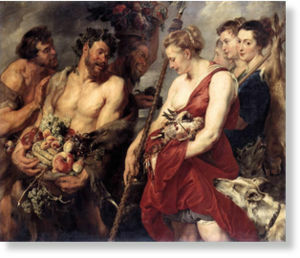 But in the meantime we can examine what effect this conspicuous and sudden switch in prehistoric society had on contemporary man and his environment, for it was at precisely this juncture when humans adopted agriculture that the ailments which plague modern humans, along with the degradation of the environment, began to take shape. Could this have been the point at which the human race derailed from evolution to devolution, possibly passing the point of no return? 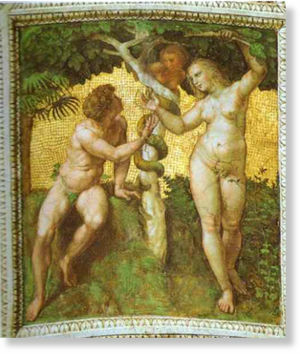 According to the old Sufi legend, Eve actually offered Adam a sheath of wheat, not an apple. This starts to make a lot of sense when we consider all the changes which the cultivation of wheat effected upon human societies. People had long gathered wheat where it grew wild, but with agriculture they began tampering with it. It was altered, production was increased, it was made more robust to withstand the harsher climate conditions as the population traversed northwest from its original homeland, the so-called Fertile Crescent spanning today’s Middle East. It is an undeniable fact that present-day wheat used for human consumption is deadly. It can kill you very fast if you are hypersensitive to gluten or very slowly if you are not. If it wasn’t for hypersensitive individuals, the detrimental effects of gluten on our health would probably still remain in the dark and deaths would be blamed on the usual suspects such as smoking or high consumption of animal fat. It is not really clear from the available evidence whether wild wheat was as prominent on the hunter-gatherers’ menu as proponents of the fortunate genesis of agriculture would like us to believe. Even if this assumption is correct, the original wild wheat before the advent of agriculture had no more than 4-5% of its protein content as gluten (and possibly even less). Furthermore, it wasn’t really a staple of the hunter-gatherer’s diet and was probably only an occasional source of energy when the hunt would fail and there was nothing else around to eat. In contrast, several millennia of hybridisation in order to increase crop yield, has resulted in contemporary wheat becoming a mutant blend of multiple plants, with as much as 55% of its total protein content comprising gluten. Apart from gliadins which belong to the larger family of gluten proteins, wheat also contains wheat germ agglutinin (WGA) – a lectin, which is essentially the plant’s natural defence mechanism. In nature everything seeks balance; as much as animals, plants also do not wish to be eaten. Gliadins and WGA cannot be destroyed by cooking and are linked to various autoimmune diseases and degenerative processes. The more the sons of Adam sought to exploit wheat, the deadlier wheat became. In other words, ‘our daily bread’ has turned into our daily poison. If we add the fact that gluten causes brain inflammation to such an extent that it interferes with our normal behavioural patterns, we begin to understand how this poison doesn’t just destroy our bodies, it also destroys our relationships. In addition to these medical issues, a very interesting social aspect of the wheat story should be noted. It appears that the cultivation of wheat precipitated the beginning of the unprecedented ‘Era of Violence’ among human societies. There is a remarkable correlation between the diffusion of agricultural technology (chiefly for the cultivation of wheat) from the Middle East to various parts of Europe between 9,500 years ago and around 5,000 years ago, and the pattern of human genetic variation across Europe. What this suggests is that farmers interbred with local hunter-gatherer populations as they slowly expanded across Europe at the rate of 1 kilometer per year over a period of 4,000 years. For example, inhabitants of the Basque region of southwestern France and northern Spain have significantly different gene frequencies from those of other Europeans, indicating that they resisted longer and more successfully against interbreeding with migrant agricultural groups from further east (although significant interbreeding still took place). This would appear to rule out the theory that the agricultural way of life spread mainly by way of ‘cultural emulation’, as hunter-gatherers simply mimicked the practices of their visibly prosperous neighbours. On the contrary, these practices were spread by migration: people and techniques moved together. This was not just a European phenomenon but was true of other instances of agricultural diffusion that have been studied so far, such as the expansion from Mexico southwards to the Andes, or the Bantu expansion south and eastwards through Africa beginning about 3,000 years ago. Although we can see from these data that migrant agriculturalists didn’t simply massacre all hunter-gatherer communities along their way, nor did they just drive them from their lands, we can nevertheless conclude that they did, in fact, interbreed with the tribeswomen while the men were put to work as slaves. Hunter-gatherers who lived in harmony with their environment never had a need for large fortified communities. Once wheat constrained humans to markedly more sedentary lifestyles, they were no longer able to rely on their usual hide-and-seek strategy when faced with enemies. A large group is far more secure than its members could be in multiple smaller groups. The result of devoting time, effort and resources to defending yourself will not just make you feel more secure, it will inevitably make your neighbours feel less secure. Perhaps, this would go some way towards explaining the driving forces behind modern society, with its capacity for brutal expansionism on a massive scale? Finally, when we take into consideration the damage inflicted to our environment through deforestation and soil depletion over a period of several thousand years, we can plainly see that the cultivation of wheat was indeed equivalent to eating fruit from the tree of inadequate knowledge. Most anthropologists agree that the cultivation of corn, or maize, is responsible for turning the Native American tribes from nomadic into agrarian societies. These days, corn is possibly the single food that epitomises the Americas. 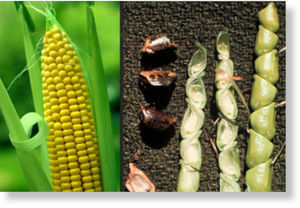 Interestingly, corn as we know it today is a human invention: it does not exist naturally in the wild and is the only grain that is not self-propagating. Wheat, for example, produces seeds that will fall and produce more wheat. Corn must be planted by man in order to grow and if left alone, would cease to exist. From a metaphysical point of view, corn might be said to represent entropy, a dead end. Nevertheless, this ‘non-existent’ plant – with our aid – has managed to silently conquer the entire planet. Many scientists believe people in central Mexico developed corn about 7,000 years ago. The common agreement is that corn was genetically engineered into existence from a wild grass called Teosinte, which looks nothing like the corn of today. This theory is widely accepted although it is very difficult to prove. According to Aztec mythology, maize was brought to this world by Quetzalcoatl and is associated with the group of stars known commonly today as the Pleiades. Cultivation of this grain in pre-Columbian America was very often connected with gruesome human sacrifice rituals to appease Centeotl – the Corn God. Centuries after mezzo American civilisations perished, Centeotl continues to claim human lives, only this time in a more subtle manner. Even in the beginning of corn cultivation, wherever this plant was introduced, pellagra would break out. This medical condition is caused by niacin (vitamin B3) deficiency. Many medical sources reason that this happens because niacin is locked inside the grain and is thus unavailable for absorption. This may be true, but did these people really eat only corn and nothing else? Knowing what we know today about gluten, casein, soy and corn proteins, we can conclude that this deficiency is, in fact, a result of damage to the intestinal wall. This damage hinders the absorption of calcium, iron, iodine, B complex (including niacin), vitamin C and numerous trace minerals (e.g. zinc, magnesium, manganese). As is the case with wheat, the damage caused by corn will become obvious early in life in susceptible individuals. Meanwhile, less susceptible individuals will suffer slowly, all the while many degenerative processes and disease caused by malnutrition will be blamed on aging. Corn cultivation rapidly changed the face of the American landscape and spread to Africa and Asia. Corn finally entered Europe via the Balkans and the Turkish empire at the end of the 19th century. At present corn continues to claim new territories. This trend will probably intensify in years to come as other governments follow Obama’s administration by subsidising corn production for ethanol to be used as fuel and as Monsanto Inc. conquers territory after territory with its genetically modified corn products. It is believed that soy was first cultivated in China and that it wasn’t until the 7th century AD that it spread to other Asian countries, then spread to the rest of the world much later. This health-robbing legume was unknown to most of the world and was cultivated in one remote area of the world for years as a non-edible plant. Used in crop rotation, the sole purpose of soy was to add nitrogen to the soil. Until one fine day someone in China decided to experiment and use it as food. They quickly learned that fermentation made soy more tolerable just like our ancestors discovered with dairy products (e.g. yogurt or kefir). Interestingly, rice and rice-based wines turned out to be antidotes for some of the harmful properties of this latest culinary creation, in the same way that Italians learned to consume wine, high fat meats, olive oil and vinegar to protect themselves against their passion for pasta. The fat and oil protects the villi from the attachment of gluten in their upcoming main course while the vinegar and wine washes clean what does manage to attach. Today the United States is the biggest producer of soy beans, followed by South American countries. Soy is touted through the media and many New Age health food shops as healthy food which is supposed to make us younger and healthier. Unfortunately the reality could not be further from the truth. Soy is full of a wide array of anti-nutrients including lectins and overwhelming levels of isoflavones. Asian nations which use soy as a staple in their diet may have a low incidence of heart disease because they don’t consume wheat and dairy, but it cannot be coincidental that they’re leaders of the pack when it comes to incidence of stomach cancer. In addition, soy may be responsible for the shortening of childhood in modern females. Thanks to its phytoestrogens, which mimic estrogen by binding to receptors allocated for this important hormone, soy has altered the outward appearance and hormonal balance of our children. Sadly, most physicians and consumers don’t realise that science is now for sale; published data often misrepresents the truth, academic medical research has become corrupted by pharmaceutical money and special interests, and government regulators more often protect industry rather than the public. Increasingly, academic medical researchers are for hire, and research, once a purer activity of inquiry, is now a tool for promoting products. Once again we see devolution at its best. Paleolithic humans never drank milk. Aurochs, the wild ancestors of modern cows, once ranged over large areas of Asia, Europe and North Africa. 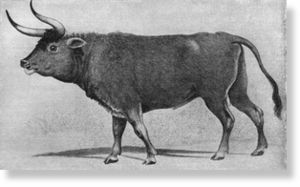 They were first domesticated 8,000 to 10,000 years ago in the Fertile Crescent area of the Near and Middle East and evolved into two types of domestic cattle: the humped Zebu (Bos indicus) and the humpless European Highland cattle (Bos taurus). Some scientists believe that domesticated cattle from the Fertile Crescent spread throughout Eurasia, while others believe that a separate domestication event took place in the area of India and Pakistan. Whatever the case, the mighty Auroch is today reduced to a genetically-inbred milk-secreting mutant, suffering tremendous abuse on a daily basis. Through analyzing degraded fats on unearthed pot shards, scientists have discovered that Neolithic farmers in Britain and northern Europe may have been among the first to begin milking cattle for human consumption as early as 6,000 years ago. According to scientists, the ability to digest milk was slowly acquired sometime between 5,000 and 4,000 B.C.E. by the spread of a genetic mutation called ‘lactase persistence’ that allowed post-weaned humans to continue digesting milk. If this date range is correct, it may pre-date the rise of other major dairy-consuming civilizations in the Near East, India, and North Africa. We don’t know exactly what prompted early humans to start drinking cow’s milk. It is a very strange habit from a biological point of view. Humans are the only mammals which drink milk as adults; this apart from the fact that drinking the milk of another species is unparalleled in the natural world. The idea of drinking the milk of any other species but domestic cattle is still repulsive to many modern humans. This could indicate that the taste for cow’s milk was acquired suddenly at some point in history, for some pressing reason such as environmental stresses, and then humans became conditioned over the millennia. As with other damaging foods, official nutritional guidelines keep ignoring some scary facts about milk. Cows’ milk contains 80-86% of a type of glycoprotein called casein (of which 39% is the alpha S-1 variety). This variety of casein is gluten’s evil twin and it has already been linked to numerous immune-mediated disorders. Furthermore, it seems that there is a link between the hormones found in milk and precocious puberty in young girls. All the toxins entering into mammalian bodies can be secreted directly through the milk. 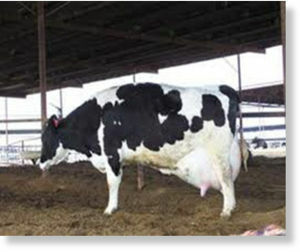 Dairy cows are fed inadequate diets laden with pesticides and other toxins, all of which end up in their milk. Most dairy cows don’t live past four years of age, even though their natural life-span averages 25 years. Why would anyone want to drink milk from such animals? In spite of all this, milk is still sold to us as “nature’s wellness drink” and one glass a day is recommended as the only good source of calcium available to modern man. So where did hunter-gatherers get their calcium from way back then if there was no “Got Milk? campaign? 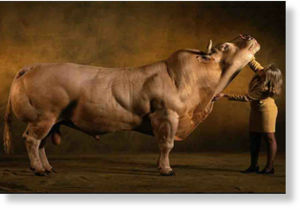 © Google Images Muscle Cow: Engineered by suppressing the production of Myostatin. Scientists have already inhibited the Myostatin Gene in mice and are working on blocking the gene in humans. Both direct and indirect evidence supports the hypothesis that early humans had a high calcium intake. Archaeological evidence reveals that hunter-gatherers who lived before the dawn of agriculture had heavy skeletons and were comparable – and even superior – in stature to present day groups. A careful examination of foods available to those early hunter-gatherers indicates that daily calcium intakes in excess of 1,800 mg were likely. Indirect evidence that the customary diets of our distant ancestors were calcium-rich and low in sodium exists in the physiology of present-day humans: calcium is absorbed and conserved inefficiently; by contrast the gut absorbs sodium completely. Can Paradise Be Reclaimed? Is a Return to the True Paleo-Diet Possible? Unfortunately the prospects of this happening are pretty slim. We have engineered our environment to such an extent that it wouldn’t be able to sustain us in the same way it was able to sustain our ancestors. An ever-increasing incidence of ecological disasters and natural catastrophes certainly don’t work in our favour either. From an evolutionary point of view, it seems that our planet is ripe for destruction. It looks like we have reached a critical mass that tipped the scale towards entropy some time ago. And yet, this bleak outlook should not discourage us from making every possible effort to reorganise our dietary habits and to detoxify our bodies as much as possible. For the majority of the population, living in the urban centres of industrialized countries, especially those belonging to the less wealthy strata of society, this may prove to be a difficult task indeed. Most of animal protein and fat available to average westerners today comes from grain-fed animals, fish and poultry. It doesn’t really make much sense to avoid grains in our diet if we are going to consume large quantities of such meat. ‘Secondary food intolerance’ is the term coined by veterinarian John B. Symes to describe the situation that arises when a food intolerant individual consumes the meat of an animal that was fed gluten grains (wheat, barley, rye), soy, corn – even dairy products – and is negatively affected by it. In addition to this there is an issue with fatty acids. Animals that eat quantities of green plants have very high levels of omega-3 fats. Conversely, animals fed largely on grain, which includes virtually all American fed animals except lamb, have very high levels of omega-6. We should have approximately equal amounts of omega-3 and omega-6 in our bodies, or at maximum, not much more than twice omega-6 to omega-3. But almost all Americans have ten or twenty times more omega-6 than omega-3, a condition that leads to all sorts of degenerative diseases. Traditionally, all beef was from grass-fed cattle, but today, what is commercially available in both wealthy and poor countries is almost all factory-farmed beef. Seventy-five years ago, steers would be 4 or 5 years old at slaughter. Today, slaughtering age is 14 to 16 months. It is impossible to raise a calf from a birth weight of 40 kg to 550 kg in little more than a year on grass alone. This horrendous feat is accomplished thanks to enormous quantities of corn, protein supplements, antibiotics and other drugs, including growth hormones. Therefore we can see that sourcing good quality animal fat, grass-fed cattle or free-range poultry, while increasingly difficult, is essential if we are to get around the noose that agriculture has tied around our necks. We can only hope that in the years to come we will see more of a movement away from industrialisation and increasing attempts to create communities based on true human values; communities which will not only heal devolved humans but will also attempt to heal our environment. The only question which remains is whether we have enough time left to try and recreate the paradise that was once lost. “The Secret History of Milk: The Truth about Nature’s Miracle Food,” an interview with Ron Schmid, M.D. “Population structure, infant transport and infanticide among Pleistocene and modern hunter-gatherers,” Woodrow W. Denham, Journal of Antopological Research, Vol. 30, No.3.